Quite a new feature for those times when you are in contact with someone who doesn’t know Adwords well – you can send them a link to the ad preview tool, so they can check for themselves if the ad is showing without adding to impressions or if it is showing in a country you are not in. To access the ad preview tool, you can select tools at the top, or hover over the speech bubble & click the link. The ad preview acts much like normal google search. 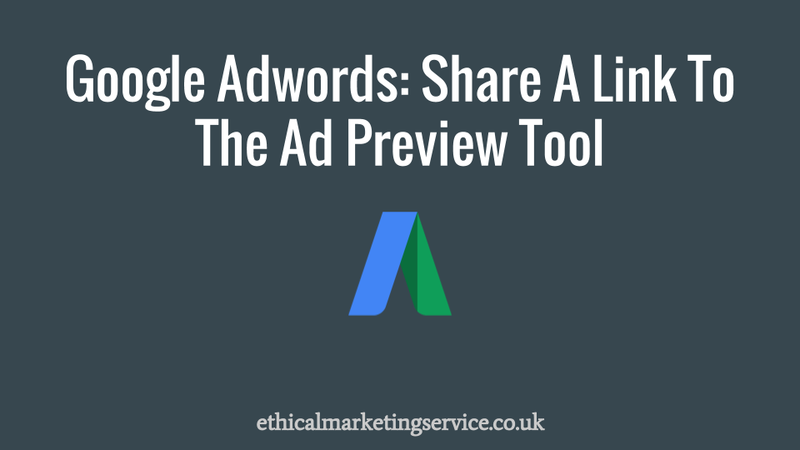 First type in the keyword you want to check if your ad is showing for and click preview. So they could see this in real time, there is a blue button labelled “share this search”. Click it and you will be provided the link, copy the link and select done. This is particularly helpful if you show ads in a country you are not in as you get a preview of how it looks in that country. This entry was posted in adwords and tagged Share A Link To The Adwords Ad Preview Tool. Bookmark the permalink.